A good design is key to a successful remodel. The design process gives consideration to each of the details of a project from start to finish. These details include not just the finishing touches, but also the structural, mechanical and plumbing requirements to deliver the desired outcome. A comprehensive design process helps ensure your project is consistent with your vision and goals, and helps establish realistic budget parameters and project expectations. Our qualified, experienced designer will guide you through this process, providing 3D renderings and detailed specifications with pricing. Don't work around your space - make your space work for you! We will evaluate your space and function relationship to ensure they align with your needs and desires. Design elements are then tailored to you! How you want to use your space and how the space will make you feel are completely up to you. 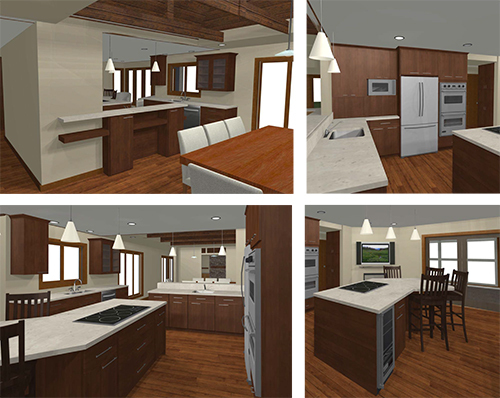 Kresge Contracting utilizes a collaborative design process. Our qualified, experienced team works with clients to create custom solutions for each project. Every effort is made to understand our client's needs. We know that your personal environment has a large impact on your emotional well-being. Let us help you create a functional space that you will love to call home. Budget - is a global financial range based on the type of project. A general dollar range one can expect to spend, often based on review of regional or local remodeling statistics and/or personal experience. Estimate - breaks the budget down into categories (e.g., countertops, cabinets, floors, etc.). Still a generalization or ball-park figure, does not include specifics relating to the actual project. Quote - a detailed written specification taking into consideration the specific project details. A thorough representation of one's project based on personal needs, goals and desires for the project. We want you to be able to make informed decisions based on your goals and budget. An actual quote helps you to understand the real cost of your project. 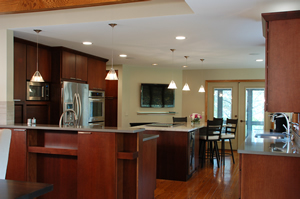 It clarifies your expectations so that both you and your remodeling contractor are on the same page. Contrast our quote to what many in the industry offer: free estimates. Free estimates are often quick generalizations based on non-specific or inaccurate assumptions. Many consumers are lured by these cheap fees or offers for a "free design" only to discover key elements missing, hidden costs when they start remodeling and that the project isn't what they had envisioned. We take the guesswork out of the equation. Because we are thorough, taking the time to understand your needs and wants, getting accurate measurements and drawing up detailed specifications, you receive a great value for what you spend. Our design fees vary based on the complexity of the project. In the end, by working with our team, you have a solid workable design that fits your vision and your budget.